Home » TMI » I met a naked man in Quartzsite, Arizona. I met a naked man in Quartzsite, Arizona. Well, duh! Of course I do. My friends, and folks I meet on my travels, give me some of the best tips. I love you people! I think there is a little satin bow on it, but I couldn’t look that closely without being accused of staring. No, NO. On the sock. Sheesh, I really have conditioned you all to go to the dark side first, haven’t I? You’re welcome. The “sock” was held up by fishing line. Nothing covered his back side. Apparently, his nakedness is not against the law in Arizona. Rumor has is he also walks back and forth across the London Bridge in Lake Havasu during the summer. 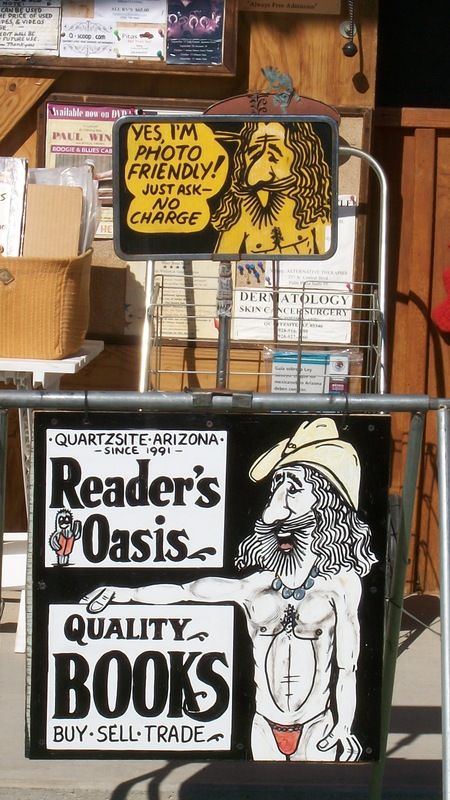 He runs a great bookstore along the highway in Quartzsite. You think I would make up a naked man running a bookstore in broad daylight? For years? Wearing nothing more than a hat and a privates-covering sock? Not a chance, people. Not. A. Chance. He’s very approachable. See? I believe this is also some of his cartoon work. He’s really quite good. Do you like our hats? PS: I’m not as chunky as I appear here. He’s just really skinny. His wife took the photo. She was wearing clothes. She likes clothes, he doesn’t. Must be one of those “opposites attract” things. As well as being a really nice guy, he’s a rather accomplished blues musician, and cartoonist. He owns the Reader’s Oasis in Quartzsite, a bookstore full of rare and vintage books and albums. Well worth the trip for the books alone. Next up I’ve got more photos for you. NO, no – there are no naked people in these. Should I just apologize again? Yeah? Sorry. They’re of a pyramid that is right here in America. Why don’t we all know about this? Americans could save a LOT of money by not having to travel half way around the world to see a pyramid. Ok, it’s not exactly “huge”. I love the sock for his junk! I’d bet his wife made it. Dude’s in pretty good shape… must be from dodging hot bacon grease or something. Or dirty old ladies. I know, huh? With a figure like that I’m thinking he probably doesn’t eat a lot of bacon. It must be dodging dirty old ladies. small sock?? That’s not very nice. Naked dude knows how to match the sock with the necklace and right there you have serious fashion maverick! I fear paper cuts and him wondering about in a bookstore brings a whole new meaning to the emo pain of a thousand paper cuts full of vinegar! Jeane’s last post ..The Animals Are Taking Over! I never thought about how it must be to work naked around all that paper. Yikes! And I didn’t even notice the sock matched the necklace. I must have been distracted by his great tan. I’m so proud of you for meeting this chap. Now, I”m confident that my own weirdness will not be too off-putting when you and I meet, someday. *Your* weirdness? I hadn’t noticed. But since you brought it up, do you have a crocheted sock? You know, for when we meet? If not, I can make you one. I’ll be shirtless in cowboy boots and Levi’s. That’s Tessa’s favorite. I know, huh? You’ve got to love the freedom we have in America! Maybe I should start blogging naked? Think that would increase my readership? Coming from a Media Director, that means something! Blogging in the buff would be a good hook, wouldn’t it? But you all would just have to take my word that I was naked while I was typing. oops guess it doesn’t have 2 work.. sry 4 taking up more space!! Ruh-roh. Thanks for the heads up… I’ll see if I can recreate the issue. Somehow the sock makes it seem more obscene than just naked. secret agent woman’s last post ..A surprising update. I think it’s the bright color against his dark tan – it makes you look. I’m most curious about the fishing line going up the back end… thong undies take some getting used to, but fishing line?? Aw, hellz no. Hiker Mike’s last post ..testes one, two, THREE! The Hook’s last post ..Hook Meets The Three Vixens! I was more nervous than I thought I would be. He was very nice, and polite and not at all creepy, so it was just me. I’ve been teased about the “A-frame” hug! Getting to this late, but then I operate like the gov’t.